Album Review : "Thulcandra - Ascension Lost"
Nowadays a lots of excellent black metal albums are releasing. In my opinion previous year was remarkable for black metal. Looking forward on this year. In this extreme metal music genre first wave black metal and second wave black metal bands are full of reverence. But to be honest at present a slew of newcomer bands are doing excellent job. In the matter of melodic black/death act Dissection came in mind at first. Death Metal with unconventional influences enjoys indeed tend quite popular. Though Sacramentum, Bane, Unanimated those are also appreciable, well established melodic black/death bands.After four year Germany based melodic black/death metallers Thulcandra are strikes back with their third full length album entitled “Ascension Lost” on 30th January,2015 via Napalm Records .Already Thulcandra is widely known for carrying inheritance of Dissection. A few days ago Decibel Magazine gave them title as “Best clone of Dissection” and positioned them in no 1 place in their list. Personally I’m not agree with the term ‘clone’. I believe each and every single bands have their own unique identity and style. I consider them as legacy of Dissection. Their latest studio effort consist with 10 tracks and 4 bonus tracks. 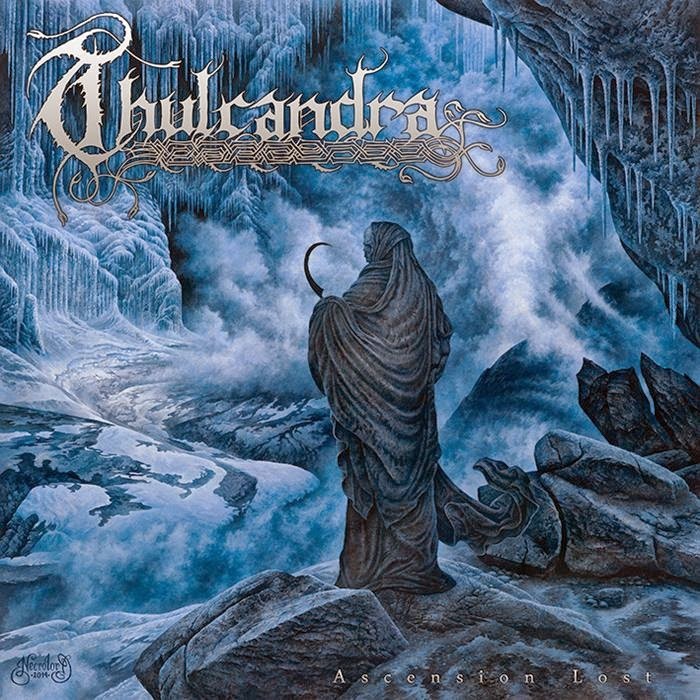 Thulcandra was formed in 2003.In before they had released two full length album in 2010 entitled “Fallen Angel's Dominion” and “Under a Frozen Sun” in 2011 .This band consist with some excellent musician. Thulcandra’s front man Steffen Kummerer who is also attached with another one well renowned progressive/technical death metal band Obscura.This is his side project .On this album drumming is done by Seraph who also playing drums for Dark Fortress, Noneuclid.Now I am going to the point about this new album. When at first I have checked out this new album I was overwhelmed and believe me this album was one of my anticipated album of this year. This bands vocalist/guitarist Steffen Kummerer is such an excellent musician appreciate his unsurpassed ability and skill. Though this bands each and every musician exudes tremendous effort on this album in radiant way and nailed it. ” Ascension Lost” contains a strong dose of black/death metal, with more atmospheric vibe, melodic aesthetic. Their whole composition and musical style borrow great atmosphere, with excellent, dazzling riffs work and obviously with frequent guitar solos. This new albums whole ambiance and compositions are brilliant .Their distinct style infused me by a lot. After a multiple listen this album infused me with their heavy, ethereal abyss ,multi-layered ,overarching, chromatic musical style laced with shredded riffs work ,melodic aspects enriched this album that is very powerful, heavy and excellent all at the same time along with a good balance of black/death metal music ,melody and brutality with strangulated ,intricate riffs work and those effective rasps simultaneously . In this whole album vocals blackened rasps, screaming voice and their deep, unrelenting melodic musical style with marvelous, exquisite riffs works builds layers of well-crafted melodic black/death through high reverb and fast to medium, mid-paced tempo. A natural synthesis of melodic sounds and disparate, antique musical soundscapes all combined in one bold, enlightened display of unbound creativity Despite the often fast, heavy form of death metal assaults with a lots of segments of black metal, quite soft and smooth edge in the guitar playing which adds to the melodic, atmospheric kind of black/death metal but at the same time the vocals and other parts of the riffing is straight forward furious simultaneously. I highly appreciate and embrace this album. Well, this albums opening track is “The First Rebellion”. This track starts with softly, delicate, complex guitar works which encapsulates majestic, flourished sound. Quickly the song returns to the sonic assailment and transformed into a whirlwind of guitar work followed by an onslaught of tremulous, dark eerie riffs and a wall of spectacular, sober drums laced with aggression, deliberate cadence. Their whole composition and musical style is impeccable also borrow great atmosphere with sour, dissonant riffs work. This album is filled with a slew of traversed, cadence, apocalyptic, ominous, hellish, devilish, melodic riffs work. As well bass line up is whopping, intense, strong, rumbling. Drumming, percussion line up is bleak, frantic, solid, clattering and powerful. Mentionable thing of this album is extremely well symphonic, rhythmic and melodic riffs works, solos and epic, exquisite, relentless acoustic interludes. This album consist with a slew of delicious, dazzling, melodic riffs solos and breathtaking symphonic swells. The solos are rightly used as an additional uncanny harmonic layer. There are a plenty of individual riffs, solo sections which sound briefly something exotic. In each track morbidly delicious, macabre, dark eerie riffs, bass lineups matched in well manner. This whole albums sound deliver a dissonant, frosty, cold, sinister, melodic, gruesome black/death metal with raw emotion and pure energy. “Ascension Lost” endures beauty of black metal. This album indulge strong songwriting and brilliant musicianship. This album have a hypnotic effect on the listener. Steffen Kummerer decently large voice that does well for Thulcandra . Especially his menacing and hoarse voice are excellent. Vocals howling scream, agony, snarling, sneering, immense, deep rasps voice emerged on this album in a well manner and intertwined perfectly with their utterly spellbinding, obtuse, evil melodic, fully blistering, dismal black/death metal, distant musical style with a lots of melodic, atmospheric accompaniment and embedded perfectly. Overall you will get sinister, gloomy, desolate ambient from this whole album. I really worship this band. Each song have an energy, fluency and draw a savage landscape .Stand out tracks are all of them. I personally cherish The First Rebellion, Throne of Will, Deliverance in Sin and Death, Demigod Imprisoned, Exalted Resistance, The Second Fall, Ascension Lost tracks. Interlude and Outro both are brilliant instrumental track. I also appreciate all bonus track. Album artwork is impressive and portrayed bleak wintry, pall of darkness vibe. Overall “Ascension Lost” whole album is Spectacular, engrossing, significant. This album sounds so authentic and a truly remarkable sonic journey from beginning to end. Indeed this album is such a true gem of this year and definitely strong contender of this year. This new album will take you on a journey into another universe. Strongly recommended to add it in your collection and obviously for Dissection, melodic black/death metal fans. This new album is superior in quality to whet your appetite.